Hast thou forgotten about Shakespeare in the Parks? 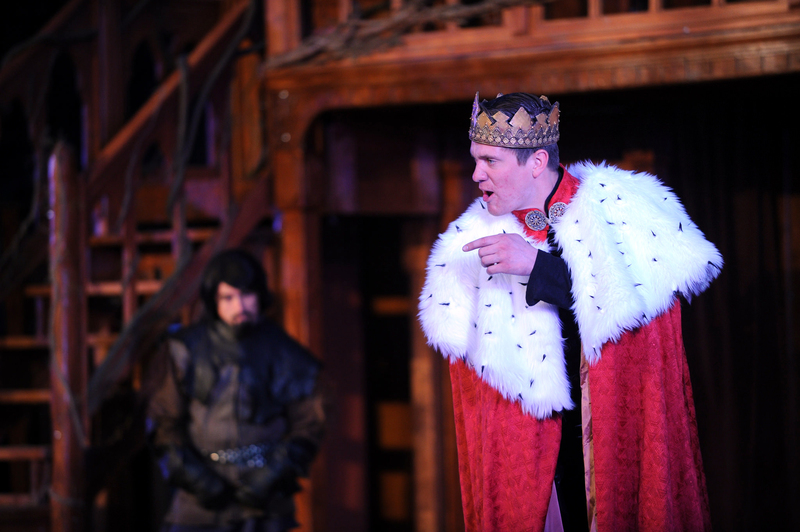 This weekend, Montana Shakespeare in the Parks (MSIP) will take us back to the days of traveling bards and minstrils with the performance of “Richard III” at the Bonner County Fairgrounds. The performance is scheduled for Sunday, Aug. 21. The gates will open at 1 p.m. and the show begins at 6 p.m.
Sam Pearson as the title characters in ‘Richard III.” Photo by Winslow Studio and Gallery. The play is directed by MSIP executive artistic director Kevin Asselin and hosted locally by Lost Horse Press, an independent nonprofit poetry press owned by Christine Hobert. Audience members are encouraged to arrive early with chairs, blankets and picnics. A medieval village activities will begin when the gates open, and will include food vendors, live entertainment and arts and crafts vendors. Everything from tribal belly dancers to live music on the hammer dulcimer by Desiré Aguirre will take place in the village. There will also be vendors offering wares that fit in with the medieval theme. There will be a hand-dyed yard and spinning wheel demonstration by Kim and Brooke Spencer and an herb- and basket-making demonstration. Lost Horse Press will feature poetry books as well. Food vendors will serve lunch and dinner beginning at 1 p.m. Recycling of trash will be accomplished by Sandpoint’s Green Team. MSIP features 10 professional actors selected from national auditions who tour without technical assistance to bring live theater to mostly rural communities throughout Montana, Wyoming, Idaho, North Dakota and Washington. The stop in Sandpoint marks the only play MSIP performs in Idaho. The tragedy “Richard III” depicts the Machiavellian rise to power and subsequent short reign of King Richard III of England. A classic anti-hero, the character of Richard III appeals to his audience as if they were co-conspirators. It’s easy to be enamored of his rhetoric while being appalled by his actions. Lost Horse Press is a community host for “Richard III” and has been responsible for raising the funds necessary to bring the troupe to their community. Lost Horse Press would like to thank grantors who have helped make this play possible, including the Idaho Commission on the Arts, Bonner County Fund for Arts Enhancement in the Idaho Community Foundation, Community Action League, Kochava and Northern Lights.